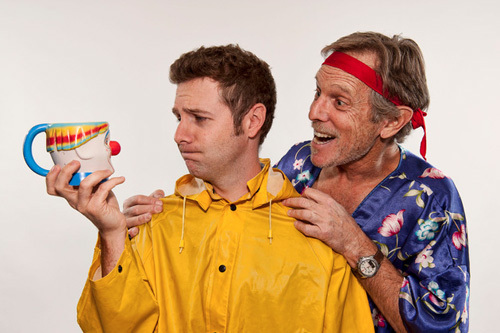 Jay Perry and Andrew Maizner in Pygmalion Theatre Company’s production of Matthew Ivan Bennett’s new comedy A Night with the Family. For many, Christmas comes with a concentrated dose of dysfunctional family “fun.” Anyone who didn’t get theirs this year can find it at A Night with the Family, Matthew Ivan Bennett’s new play being staged by Pygmalion Productions. The comedy takes us back to the holiday with an energetic performance that audiences will either find a hilarious and cathartic experience, or one that reminds them why they’re grateful Christmas only happens once a year.A Night with the Family opens with Donny (played by Jay Perry) arriving at his father’s house already in a foul mood because his dad forgot to pick him up at the airport. He cools his heels outside while Donald senior (played by Andrew Maizner), fresh from taking a steam and dressed in a silk purple robe, fumbles through massive piles of clutter trying to find the key needed to unlock the door from the inside. Their shouted conversation on opposite sides of the door flips quickly between Donny’s initial frustration to his curiosity as to why Dad has changed the doorbell ring from “Home on the Range.” The pace of the play is set, and it calls to mind Black Friday shoppers clamoring to be the first ones to get through department store doors that open at o’ dark thirty. Over the course of this Christmas Eve, Donny’s sister Bree (played by Elise Groves) pesters him about his relationship problems. She’s soon joined by mom Diane (played by Teresa Sanderson), who arrives with her much younger French-Canadian boyfriend Antoine (played by Jesse Peery). Everyone is so busy bickering that Donny never gets to say much. He ultimately has a panic attack, and between the Lortab Diane gives him and the fruit smoothie with a few surprise shots of Jagermester his father makes him, Donny looses consciousness and crashes to the floor. End scene one. In scene two, the pace slows down a little, allowing for moments of revelation. Donny finally reveals that he is treading on new territory in his marriage, and it forces him to face a big life decision. Donald is exploring a New Age, carefree way of life but he’s carried a secret since his divorce because he wants to protect the children. Bree used to enjoy photography, but she hasn’t picked up a camera in years because she’s busy raising a family of four. They’re all relatable, complex characters drawn to life through a skilled cast. At times, however, physical humor dominates the stage and the intriguing character development takes a back stage. While discussing the complexities of his relationship with Diane, Donald becomes infuriated and throws a cake at Antoine. He misses, splattering the wall with white frosting. Shortly after, the two become engaged in a sword fight that travels over the top of the couch and ends with them crashing against a bookcase next to a precarious pile of cardboard boxes. Bennett captures the chaos of the holidays. He tells a story with very well thought out characters, and through them he tackles some deeper universal questions about family dynamics. The tone is never allowed to get too serious, though this is not always a plus. Ultimately the play lacks a balance between humor and story development. It starts off at break-neck speed and doesn’t let up until the last 10 minutes. Some will take as much delight in the antics of A Night with the Family as they do in the real holidays, but for others the play, like the real deal, will leave them exhausted. Author’s Note: Props to Pygmalion Production for having an eco-friendly program. Awesome idea, but next time it would be great to see information about the running time of the play, whether or not there is an intermission and how long it will be, and the dates of the production. A Night With the Family is at the Black Box in the Rose Wagner Performing Arts Center at 138 W. 300 S. The play runs through May 11. Tickets cost $20. To purchase tickets visit http://www.arttix.org or call (801) 355–ARTS.